In the Bible olive-oil alone is mentioned, although it may be inferred from the expression "shemen zayit" that other oils were known. Oliveoil, like grain and wine, was one of the chief products of Palestine; and at an early period it was exported to Egypt and Phenicia, figuring also in the payments of tribute. It formed, moreover, a substitute for animal fats and butter, and was used not only for cosmetics, massage, and medicine, but also for the purposes of cooking and illumination. In early timesoil was kept in horns ("ḳeren"), but later in flasks and jars. It became an object of luxury, and typified wealth and fertility, while its smoothness metaphorically denoted flattery. 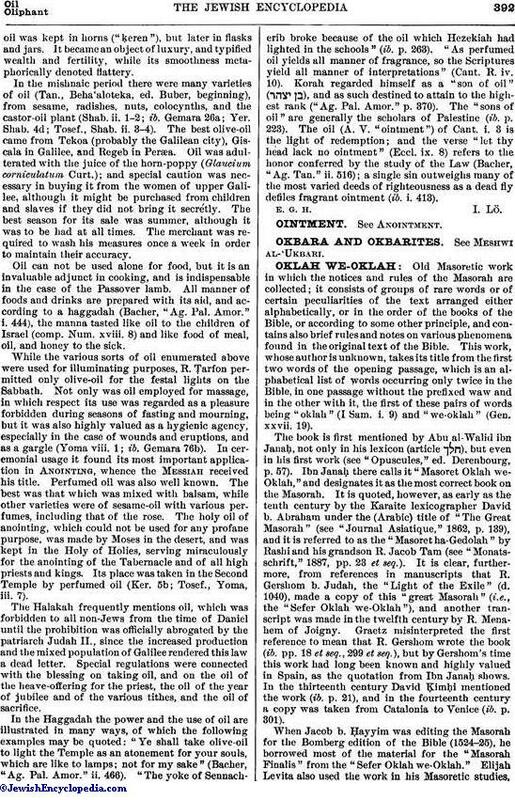 In the mishnaic period there were many varieties of oil (Tan., Beha'aloteka, ed. Buber, beginning), from sesame, radishes, nuts, colocynths, and the castor-oil plant (Shab. ii. 1-2; ib. Gemara 26a; Yer. Shab. 4d; Tosef., Shab. ii. 3-4). The best olive-oil came from Tekoa (probably the Galilean city), Giscala in Galilee, and Regeb in Perḳa. Oil was adulterated with the juice of the horn-poppy (Glaucium corniculatum Curt. ); and special caution was necessary in buying it from the women of upper Galilee, although it might be purchased from children and slaves if they did not bring it secrétly. The best season for its sale was summer, although it was to be had at all times. The merchant was required to wash his measures once a week in order to maintain their accuracy. Oil can not be used alone for food, but it is an invaluable adjunct in cooking, and is indispensable in the case of the Passover lamb. All manner of foods and drinks are prepared with its aid, and according to a haggadah (Bacher, "Ag. Pal. Amor." i. 444), the manna tasted like oil to the children of Israel (comp. Num. xviii. 8) and like food of meal, oil, and honey to the sick. While the various sorts of oil enumerated above were used for illuminating purposes, R. Ṭarfon permitted only olive-oil for the festal lights on the Sabbath. Not only was oil employed for massage, in which respect its use was regarded as a pleasure forbidden during seasons of fasting and mourning, but it was also highly valued as a hygienic agency, especially in the case of wounds and eruptions, and as a gargle (Yoma viii. 1; ib. Gemara 76b). In ceremonial usage it found its most important application in Anointing, whence the Messiah received his title. Perfumed oil was also well known. The best was that which was mixed with balsam, while other varieties were of sesame-oil with various perfumes, including that of the rose. The holy oil of anointing, which could not be used for any profane purpose, was made by Moses in the desert, and was kept in the Holy of Holies, serving miraculously for the anointing of the Tabernacle and of all high priests and kings. Its place was taken in the Second Temple by perfumed oil (Ker. 5b; Tosef., Yoma, iii. 7). The Halakah frequently mentions oil, which was forbidden to all non-Jews from the time of Daniel until the prohibition was officially abrogated by the patriarch Judah II., since the increased production and the mixed population of Galilee rendered this law a dead letter. Special regulations were connected with the blessing on taking oil, and on the oil of the heave-offering for the priest, the oil of the year of jubilee and of the various tithes, and the oil of sacrifice. In the Haggadah the power and the use of oil are illustrated in many ways, of which the following examples may be quoted: "Ye shall take olive-oil to light the Temple as an atonement for your souls, which are like to lamps; not for my sake" (Bacher, "Ag. Pal. Amor." ii. 466). "The yoke of Sennacherib broke because of the oil which Hezekiah had lighted in the schools" (ib. p. 263). "As perfumed oil yields all manner of fragrance, so the Scriptures yield all manner of interpretations" (Cant. R. iv. 10). Korah regarded himself as a "son of oil" ( ), and as such destined to attain to the highest rank ("Ag. Pal. Amor." p. 370). The "sons of oil" are generally the scholars of Palestine (ib. p. 223). The oil (A. V. "ointment") of Cant. i. 3 is the light of redemption; and the verse "let thy head lack no ointment" (Eccl. ix. 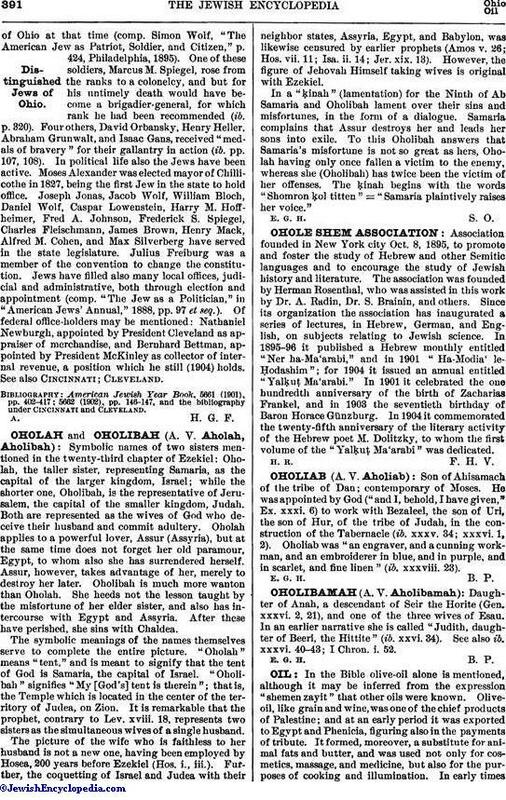 8) refers to the honor conferred by the study of the Law (Bacher, "Ag. Tan." ii. 516); a single sin outweighs many of the most varied deeds of righteousness as a dead fly defiles fragrant ointment (ib. i. 413).